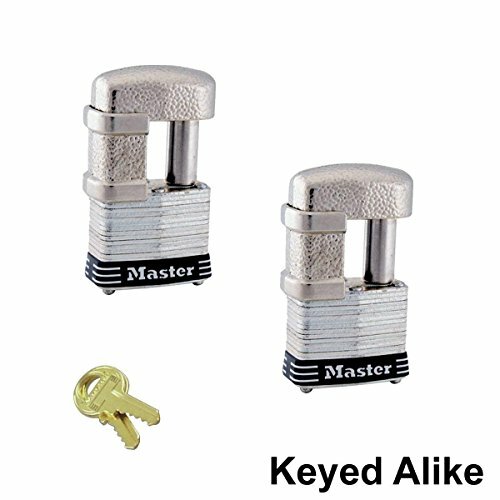 Master Lock - (2 Keyed Alike Trailer & Multi Purpose Padlocks, 37KA-2 by Master Lock at N Online Agency. Hurry! Limited time offer. Offer valid only while supplies last. This listing is for TWO (2) padlocks keyed alike (same key unlocks all) and four keys. The lock is also available with Bump Stop Technology. Search 37NKA in our storefront. APPLICATION: These padlocks are ideal for all outdoor applications when needing multiple locks that utilize ONLY one key. The #37 latch lock works well on 1-7/8 and 2 inch couplers and on virtually all standard hasp applications. These locks have a removable shackle sleeve. Sleeve off - Secures coupler latches. Sleeve on - Works best with hasps. TO FIT COUPLER LATCH: Remove the shackle sleeve. Shackle fits standard opening of 9/32" (7mm). Note that non-rigid shackle has enough play to fit virtually all coupler latches less than 7/8 wide. IMPORTANT NOTE: If using this style lock on a trailers coupler latch please be aware it is NOT recommended for all 2-5/16 couplers. It will fit some 2-5/16 couplers, the exception being 2-5/16 couplers that have the latch partially recessed from the top surface of the coupler, or latches that are wider than 7/8. SPECIFICATIONS: 3/4" (19mm) Armored Shackle Guard helps block bolt cutters. Revolving, case-hardened steel shackle sleeve resists cutting and sawing.